The debate over whether analogue gear really sounds better than its digital counterparts is an argument without a simple answer, and one that's not likely to be resolved any time soon. What is more clear cut, however, is the fact that there's something inherently inspiring about the hands-on, DIY ethos of creating sounds with classic gear from the days before we could rely on preset libraries and instant recall. 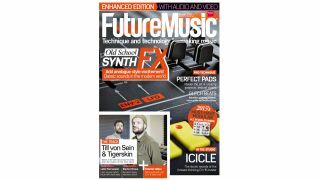 That's the main crux of this month's Synth FX cover feature - exploring the basic concepts behind the creation of dynamic, dramatic and downright weird sounds in the hope that it will encourage you to stumble upon something truly sonically unique. Whether you're working with hardware or software, getting hands-on and designing your FX sounds from the ground up is a great way to discover the true potential of your favourite instruments. New gear special! All the modular news from NAMM 2015 including Waldorf's nw1, an Oberheim module, Make Noise's Telharmonic, and more!